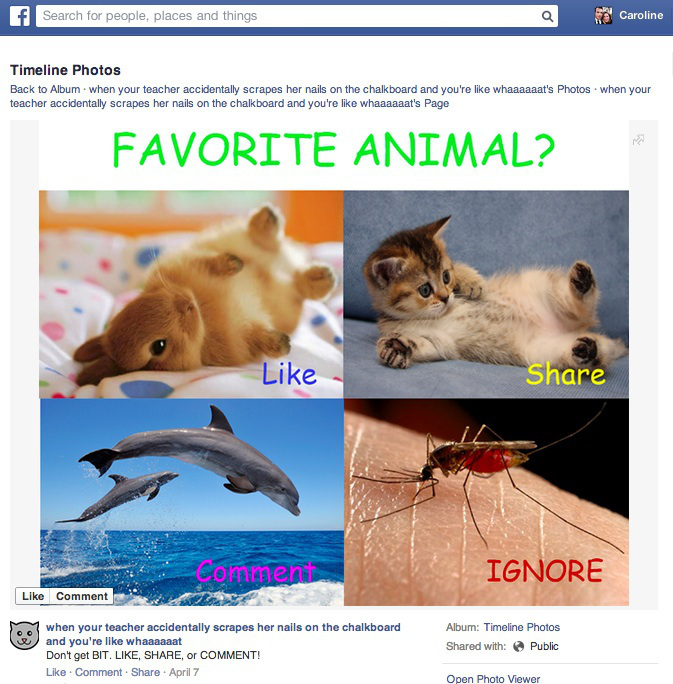 Are you getting sick of seeing posts that seem to be begging for Likes and Shares on Facebook? You’re probably going to start seeing less of them now. Facebook recently announced a few improvements that will help clean the spam out of your News Feed. This poorly designed image is an example of a blatant “like baiting” post on Facebook. Great Facebook posts can be shared over and over again, but it’s a different story if the same person or page uploads the same content over and over. Facebook’s update aims to “de-emphasize” pages that frequently reshares and reuploads the same content. Their initial tests showed that the new change reduces the number of stories people hide from pages by 10%. Facebook is also cracking down on shared links that lead users to spammy websites that are full of ads and “frequently circulated content.” To detect these spammy links better, Facebook measured how often users who visit a link Like or Share the original post. The News Feed update reduces the instances wherein these spammy links appear. Initial testing has resulted in a 5% increase in clicks on links that take users outside Facebook. Does this mean you should stop posting your Facebook marketing and promotions? There’s no reason for that (unless you are guilty of any of the three types of spammy posts listed above). As long as you know your target audience very well, create awesome content that is relevant to their interests, and don’t bug them for Likes/Comments/Shares, you don’t have to worry.